It’s officially movie season. And by that, I mean the kids are back at school, the weather has become gloomy and drab and it seems we’re all just too wrecked to leave our houses. So movie nights in, it is! My preference in movies definitely leans towards more stirring, period dramas focusing on social epidemics. The hangover of my studies in anthropology, perhaps? Light-hearted rom-coms aren’t my thing (which is why nobody ever wants to come to the cinema with me). However, I do make exceptions; If they have nice set design, I’ll watch them. Kitchens, in particular, are very much my thing. There are even some I’ve re-watched on several occasions just because they’re visually pleasing. And then there are some that I’ve yet to see, but have included them in my illustrious list of Movies I’d Watch Just to See The Nice Set Design Even Though I Don’t Care Much for The Plotline nonetheless. What’s on that list? Well, I’m glad you’ve asked! If you ask me, Meryl, the most complicated thing in your life is why you want to rip this kitchen down and replace it? Yes, it’s unfitted and slightly small, but it’s charming and has all of the chef’s essentials at easy reach. The whole Spanish style ranch house in this film is beautiful. If I had a house like that, I wouldn't care about no man. 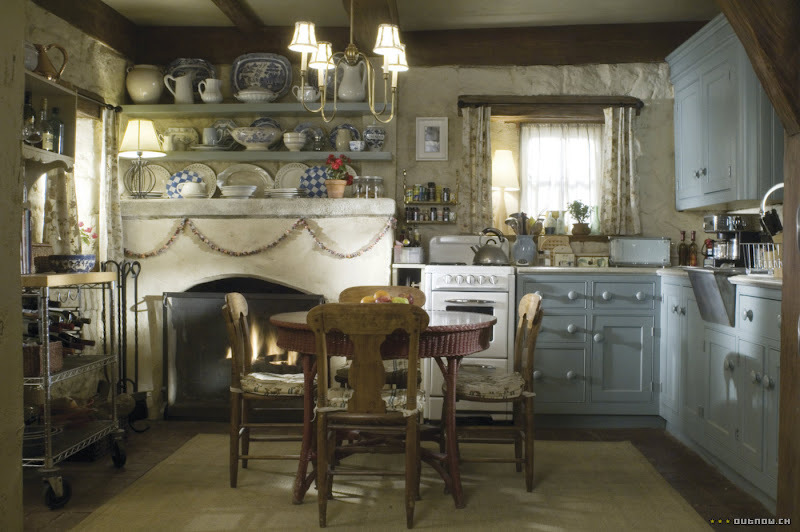 This is one that I haven't actually seen, but came across still shots online and loved the movie's cottage kitchen. The gingham inserts in the shabby chic-style cabinets and hanging pot rack will definitely be too cutesy for some. But can we all agree that the shiplap walls and retro stove are kind of amazing? This is another movie I haven’t seen, but industrial loft kitchens are right up my street, so this makes the list! The set design for this movie was done by the incredible New York-based design duo Robin Standefer and Stephen Alesch of Roman and Williams. They’ve been the masterminds behind some of the coolest hotels, restaurants and retail units in the world, including two of my faves- the Ace Hotel and the GOOP pop-up store. In this space, I’m loving the jumble sale vibes of the carpentry work bench in lieu of an island, drafting chairs, chalkboard and plate rack that looks like it came from your granny’s kitchen. All illuminated by schoolhouse light pendants, no less. Coincidently, this next kitchen is also another Roman and Williams creation. Haven’t seen this movie either, but I’m guessing it has something to do with witches? Maybe witches who use all of their magical powers to make a nice kitchen for themselves? This kitchen is massive and traditional, but there’s also something quite creepy about it. The use of standalone benches and butcher blocks makes this space appear to have more nooks and crannies than other kitchens of this size. The intricate detailing on the woodwork, oversized tiles and wide-planked flooring all make it feel aged; as though it was built before the days of standard issue sizing. This 2003 movie might well have been the catalyst for the white kitchen units/ subway tiles/ Wolf stove/ black soapstone counter tops craze we've been seeing for the past number of years. It's a combination that works really well and can be pulled off on any budget. My favourite detail in this space is the little latch knobs on the upper cabinets. The third and final Nancy Meyers movie of this blog! That wasn't intentional... But what can I say? She's as good at hiring set designers as she is at making adult relationships look incredibly complicated and terrible. Possibly the most ridiculous of all were the two love affairs that developed (over a number of days might I add) between two couples who live 8,750 km apart in the modern-day Christmas eh, "classic", The Holiday. The movie's saving grace? Iris' cottage was nice. Of course, no blog about movie kitchens could be written without mentioning the kitchen that millions of Americans learned to cook from; Julia Child’s kitchen in Cambridge, Massachusetts. The kitchen is replicated not only in the 2009 comedy, Julie & Julia, but is also on display at Smithsonian's National Museum of American History which I’m dying to visit. Not fancy at all, this kitchen is all about function. Her signature pegboard was an inexpensive way of storing pots and pans, though I think displaying the copper pots added a decorative element too. Another interesting thing about this kitchen was that the base units were custom-built taller than average to accommodate Julia’s height of 6’2”. If you have any suggestions for pretty-kitchened movies, I'd love to hear 'em!